It’s almost time to say goodbye. 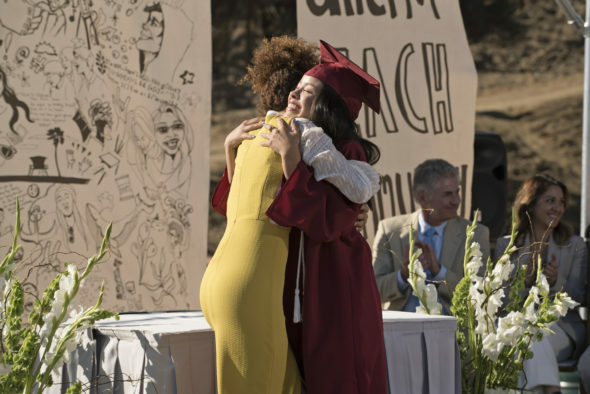 On the heels of last night’s spring season five finale, Freeform has announced a three-night series finale for The Fosters TV show. Watch a preview, below. Back in January, Freeform confirmed the fifth season of The Fosters would be the final one, leaving it effectively cancelled. The Fosters three-part TV series finale will kick off on Freeform on Monday, June 4 at 8:00pm ET/PT and wrap up on Wednesday, June 6th, also at 8:00pm, with a supersized episode. A Freeform family drama, The Fosters stars Teri Polo, Sherri Saum, Hayden Byerly, Noah Centineo, David Lambert, Maia Mitchell, and Cierra Ramirez. The story centers on Stef Foster (Polo), a dedicated police officer, and school administrator Lena Adams (Saum). An interracial lesbian couple, Stef and Lena are raising a blended family of foster, biological, and adopted kids, in San Diego. The story will continue, with a still untitled Fosters spin-off, starring Mitchell and Ramirez. Learn more about The Fosters TV series finale from this freeform press release. Freeform announced today that the GLAAD award-winning series will conclude with a special three-night series finale event that will premiere on Monday, June 4 at 8:00 p.m. and conclude on Wednesday, June 6 at 8:00 p.m. with a supersized episode. What do you think? Are you a fan of The Fosters TV series? Do you plan to check out the finale on Freeform? They should not cancel The Fosters! Every show I’ve ever liked has been canceled, like Constantine! How crazy that this series ended…. and ended on such an incomplete note?! I’m hopeful something is done about the, and with this 3-day finale, perhaps that is the case. Tsk tsk on the producers. Loved this well made show that was forward thinking and up to date on current state of our society. This 61 yr old mother & grandmother enjoyed this very progressive and emotional show. Thanks again to the cast and crew…see you in June! So sad to see this series end. It was the first in a long time that I looked forward to watching each week.